What is the Difference Between Biogas and Biomethane? Biogas is the name given to the gas produced by a process called anaerobic digestion, where microorganisms convert biomass, plant and animal material, to biogas in the absence of oxygen. The biogas when it emerges from a digester is roughly 60% methane and 29% carbon dioxide, with trace elements of hydrogen sulphide. It is not high quality enough to be used as fuel gas for anything other than simply gas stoves, and specially corrosion protected machinery. The corrosive nature of hydrogen sulphide alone is enough to destroy the internals of all normal gas burning equipment. The biogas produced by landfills has usually been used to fuel reciprocating gas engines and generate electricity, but even when specially designed gas engines are used the impurities in raw biogas tend to result in high maintenance costs. The solution is the use of biogas "upgrading", which is another word for using purification processes which produce very nearly pure methane, which is clean enough to inject into national natural gas grids, or use as a substitute for compressed natural gas as a "clean" transport fuel. Biomethane is simply biogas which has been cleaned up, or "upgraded". During upgrading the contaminants in the raw biogas stream are absorbed or scrubbed, leaving substantially more methane per unit volume of gas. Traditionally there were four main methods of upgrading: water washing, pressure swing adsorption, selexol adsorbtion, and amine gas treating. Nowadays, there is increasing use of gas separation membrane technology to perform this function. There is a little more to it than that, but in a nutshell that is the difference between biogas and biomethane. Before gas grid injection, or transport vehicle fuel use can occur the biomethane must be compressed. In addition the nature of the biomethane may need to be further adapted to the corresponding qualities of natural gas. Biogas is considered to be a renewable resource because its production-and-use cycle is continuous, and in theory it generates no net carbon dioxide. In reality, inefficiencies of the biogas process and energy expended during upgrading, means that some carbon net emissions do occur. Nevertheless, its use produces far lower carbon emissions than almost any other process and biomethane is a renewable fuel with more uses than we could possibly list here, and an inexhaustible market. Unlike solar, wind, and wave energy biomethane provides 24/7 energy availability. Biomethane can even be used as a raw material to produce all the plastics which are currently manufactured from petroleum products. We hope we answered you question about the difference between biogas and biomethane. Much more about this subject can be found at our website Anaerobic-Digestion.com. This heavy-duty sanitation truck runs on renewable natural gas made from converted landfill gas. Renewable natural gas (RNG), or biomethane, is a pipeline-quality gas that is fully interchangeable with conventional natural gas and thus can be used in natural gas vehicles. RNG is essentially biogas (the gaseous product of the decomposition of organic matter) that has been processed to purity standards. Like conventional natural gas, RNG can be used as a transportation fuel in the form of compressed natural gas (CNG) or liquefied natural gas (LNG). RNG qualifies as an advanced biofuel under the Renewable Fuel Standard. Biogas typically refers to a mixture of different gases produced by the breakdown of organic matter in the absence of oxygen. Biogas can be produced from raw materials such as agricultural waste, manure, municipal waste, plant material, sewage, green waste or food waste. Biogas is a renewable energy source and in many cases exerts a very small carbon footprint. Amazingly, natural gas can be produced from a variety of sources, including a pile of garbage. The process from trash to gas makes natural gas a renewable fuel. Biogas is the term used for the methane that is developed from the breakdown of organic material in the absence of oxygen from sources such as sewage, municipal solid waste, and farm waste. Biomethane is the fuel that is produced by refining and removing any impurities from the biogas. And unlike fossil fuels, which are considered a finite resource, the natural gas produced from these sources is a renewable resource. At the time of the first REA UK Biomethane Day in 2012 the UK had not completed any Biomethane projects. In 2013 there was one, Rainbarrow Farm, joined by two more in 2014. By the end of 2015 there will be fifty one completed Biomethane projects and by 1st April 2016 there will be sixty one operational Biomethane to Grid projects, with the UK having the fastest growing, most innovative and diverse Biomethane market in Europe. Unlike other sources of renewable energy—such as solar and wind—biomethane doesn’t need the sun to shine or the wind to blow. Waste material can be converted into deliverable, renewable energy 24/7! Hey! Thanks for reading this article. I promise it’ll be worth the few minutes. Steve Last here. I’m the founder of IPPTS Associates, and an experienced environmental consultant currently completing a number of projects in the UK anaerobic digestion industry. I’ve been in business for 10 years now, and I’ve stumbled upon some powerful indications of the way the UK AD industry will produce great business opportunities in 2017. I’ve got some great news I’d like to share with you. 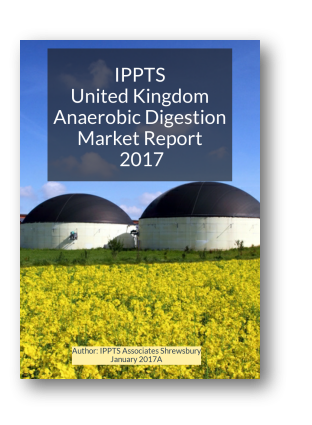 I've just published my book entitled IPPTS Associates Biogas Report titled: UK Anaerobic Digestion Market 2017. In my report, I reveal everything about making the agonising decision of, do I commit many hours and multiple thousands of pounds on a new Anaerobic Digestion and Biogas Plant facility when the UK government's subsidy levels are falling?. Readers have already started calling my ebook report a very useful "pointer toward what might happen during 2017". See, I’ve worked tirelessly over the past 10 years to find ways to help others appreciate the value of the anaerobic digestion process to their farm businesses. After some grueling, "trial and error" experiences over the years, I’ve managed to mold all of this useful information into something that can be shared with the world. In the past, there was only a small number of people who had access to the secrets of the type given in this book. And, it was usually the people who were already aware of the many benefits of anaerobic digestion to UK businesses. But now, I’ve long thought that this is something that needs to be passed on. And I want you to have all of my secrets and strategies! Now, you might be wondering if this is the right selection for you. Are you a dairy farmer always losing money due to poor milk prices? Are you an arable farmer always losing money due to poor agricultural crop sales in poor growing seasons, or finding the prices for a good crop fall due to over production in the good years? Are you tired of having an over-reliance on highly variable agricultural incomes from year to year, and a lack of the resilience seen in other businesses which gain income from a variety of sources. Maybe you just can’t seem to figure out whether anaerobic digestion will remain a profitable option after UK government subsidies drop further, as they have been announced to do in April this year? Do any of the above sound like you? If you answered yes to at least one, then you’ll want to pay very close attention. Because the secrets in this book will show you how to weigh up the opportunity to invest in anaerobic digestion in 2017, like never before. Now that you have a better idea about whether or not this book is for you… I’d like you to imagine the future. What if you never had to worry about losing money due to poor agricultural crop sales in poor growing seasons, or finding the prices for a good crop fall due to over-production in the good years? What if you could never suffer from an over-reliance on highly variable agricultural incomes from year to year and a lack of the resilience seen in other businesses which gain income from a variety of sources. available at any time? What if you could generate your own power, and use it in your business, anytime you want? What if you could produce your own fertiliser and actually charge people to take their organic waste to make that fertiliser? Well, that's exactly what anaerobic digestion is doing for thousands of farmer around the world already. If you download this ebook and apply all that you see in it, I guarantee a new awareness which if grabbed and acted upon everything mentioned above can happen for you. I say this because I designed this book in such a way that anyone, regardless of their skill level, can easily understand its contents and immediately apply them. If this is something that interests you, here’s what you need to do next. First, this is optional but highly recommended, fill out the newsletter subscription form above right to be sent notification of future ebooks and articles. The reason you need to fill out this form is becauseI will be creating more articles, and offering more ebooks for download, which I am sure you will not want to miss out on. And I need to know where to send them. Finally, the last thing you have to do is click the link below to get started. But before you click the link, here’s something I need you to know. There isn’t a never-ending supply of this book. We can only give away one hundred copies. And once they’re gone, they’re gone forever, and I will have to start charging. So it’s safe to say this won’t be around for long. If you want these secrets, you want to make sure you get your copy and act fast before they’re all gone. I’ve put my everything I know into this book. All my experience, ideas, and predictions for 2017 are wrapped up inside each and every page. I know that if you take note of everything I show you...you can get further in reaching whatever AD plant development goal for you set for yourself...and...your business. Go ahead and click the button on this page to download today!